We often picture the Star Wars scene where Luke and the gang see Princess Leia's hologram plea, "Help me, Obi-Wan Kenobi. You're my only hope," when thinking about the pickle BlackBerry's in. Today, whispers of a new hope for the crashing tech firm have arisen in the form none other than Lenovo. 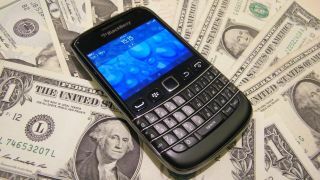 "Hope" may not be exactly the right word as the Wall Street Journal reports the Chinese hardware maker is looking for an all-or-nothing BlackBerry buyout. According to the publication, Lenovo is actively considering purchasing the Canadian company behind BlackBerry 10. It's even entered into a "nondisclosure" agreement so it can peak the Berry's books, the Journal reported. If a deal goes through, it would be one of the largest and most high-profile pickups of a Western company by a Chinese firm, in or out of the tech industry. While government scrutiny is part and parcel of deals like this, this buy would likely be subject to even more rigorous study since both the Canadian and US governments make frequent use of BlackBerry hardware. Relations between Chinese tech firms and the US government haven't been particularly friendly. If you have a feeling Lenovo's name has been tossed about in relation to buying BlackBerry before, don't worry. You didn't dream it. In March that we reported on Lenovo CEO Yang Yuanqing's comments that purchasing BlackBerry "could possibly make sense." He wasn't bullish about a buy, but Lenovo hasn't made a secret of its desire to move deeper into mobile. Yang's admission came 2 months after another Lenovo exec said the company was looking for opportunities to expand its mobile business. BlackBerry (then still known as RIM) was named as one of those opportunities. Now, it looks like Lenovo has sniffed out the opportune time to strike. If the Journal's report is accurate, it faces competition not only from Fairfax Financial, the first company to go public with its bid, but also BlackBerry co-founder Mike Lazaridis, among other bidders. If you've been living under a rock, you need to get caught up on the iPad mini 2 release date, news and rumors.